A Chicago cabbie, originally from Bangalla is found in a drug safe house with others turned into zombies. (The voodoo kind, not the other kind.) The man bares the Good Mark (having saved the previous Phantom once) and the lead DEA agent is Diana’s cousin, Don Palmer. So he calls in the Phantom to consult. They figure out the guilty party is former dictator Paolo Mbeye, now a snitch for the US Government. Too bad his handler is in on what he’s also doing and warns Palmer to lay off him. That night the Phantom tries to reach his friend, to fight the voodoo drugs and begins to succeed just as someone starts shooting through the window. What they got right: I love the little moments between Palmer’s subordinates, Greaves and Coughlin, and Devil. Sometimes the best comic relief is the ones in smaller doses as long as it feels natural to the story. The story itself is interesting. What they got wrong: I had to look up Don’s first name in the Phantom wiki to see if he is a character from the comic strips. He is, so why not give his full name for the first appearance in the Moonstone books? Recommendation: This is starting out to be a good story. If it ends as strong as it starts next issue it’s worth checking out. 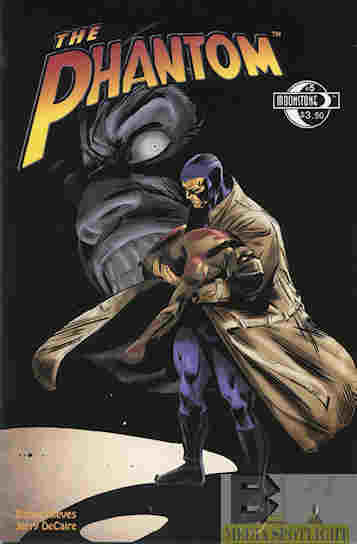 Posted by ShadowWing Tronix on March 23, 2018 in Yesterday's Comics and tagged Devil (the Phantom), Moonstone Books, The Phantom.